Praia da Conceicao Beach, Fernando de Noronha, Brazil. Praia do Conceicao has two names, Conceicao and Italcable beach. Nossa Sª Da Conceicao Fort on the beach was converted into a hospital during the 18th century. Later some Italians made their home on this beach while the telegraphic cables were being laid under the sea and thus the beach also got the name Italcable. 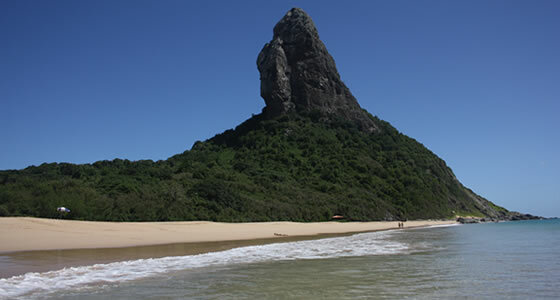 Praia do Conceicao is a very big beach and sits at the base of Pico Mount. This beach is frequently visited by locals and tourists. Praia do Conceicao is the longest beach off Fernando de Noronha, hence it is very foot-friendly and a perfect place for people who enjoy taking long walks along the shore. The large extensions of this sandy stretch are surrounded by coconut trees. The beach is a surfer’s paradise because it is known to have the best waves at great swells. The best time to surf in these waters is between the months of December and February. You can go skin diving into the waters, when the sea is calm and pleasant during the months between March and November. Scenic landscapes and sunset viewing from the shore is the added attraction at Praia do Conceicao. Since it is the most frequented beach, you will not be left thirsty or hungry. Quite a number of bars small eateries and drink stands dot the shore line to offer a refreshing drink.